Ask fellow campers about "Apache RV Park" and nearby attractions. Nice Wide Pull Through Site, Very Quiet, Wide Open - Easy Maneuvering - Roads were a little muddy due to recent rain. Roads need to be covered with a thick layer of gravel. No Cell or Data - Good Sat - No OTA We camped at Apache RV Park in a Motorhome. I agree with the other reviewers. 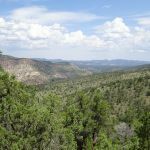 This campground is a great value and a more than adequate base from which to explore the Gila National Forest. The sites were very level and the hookups good, but there weren't any amenities like patio furniture. We didn't use the bathrooms and showers. I think there was only one other camper when we stayed in mid August, but we were told that they get real busy in hunting season. There is no cell phone service there from any providers. The closest reliable spot for Verizon is six miles toward Reserve at the top of a hill. The campground wifi was reliable but very slow (good for email). We are thankful to the owners that this campground exists in such a beautiful but sparsely populated place. We camped at Apache RV Park in a Motorhome. Enjoyed our stay. Clean park, reliable utilities, appreciated the wifi. Someone was always around if we required anything. Space accommodated our pickup plus one more. We camped at Apache RV Park in a Fifth Wheel. We were elk hunting. Reserve is a quirky little town. Also you're not too far from Glenwood and the Catwalk. NIce park with clean showers and bathrooms. 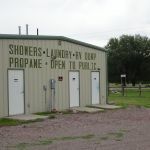 It also has propane filling station; along with a very nice laundry facility. We camped at Apache RV Park in a Fifth Wheel. A small park right off the highway, but very little traffic and noise. Managers on site and very friendly and helpful. Very clean. Easy access. Elk hunter's paradise. Many 5th-wheels seem to be parked semi-permanently with owners coming to stay during season. Only problem: Wi-Fi wants to charge 7 day minimum for $12. Doesn't make much sense if you rent space by the day. We camped at Apache RV Park in a Motorhome. Very nice park. Owners are on site and are very friendly and welcoming. This park has the potential for greatness. As it is, the spaces are very roomy with electric, water and sewer. Many permanent residents; are cordial. On a NM highway in a wonderfully scenic remote location. Quite at night. What's missing??? Cel phone coverage, pay phone, internet access. If you want to get away, really get away, this is it. And bring your ATV's. We camped at Apache RV Park in a Motorhome. Very clean park in a nice meadow setting surrounded by mountains. Staff was friendly and helpful. Propane available. Mostly level sites with gravel and a pine tree at every location. Great base camp to explore the Gila wilderness. You can access miles of trails for ATVs accessible from the park itself. Pull through sites were wide enough for 2 trailers of my size (38 foot with slides). Quiet this time of year. We were the only nightly campers there. Would have given a 10 if some playground equipment or a game room was on site. We camped at Apache RV Park in a Fifth Wheel. I feel proud to be the first to bring this campground to the database. It is a gem that I stumbled upon quite accidentally. While it is not particularly new, this campground is not presently in any other database, as far as I know. The campground is in Cruzville at mile marker 16, a few miles west of the continental divide. Cruzville is between Aragon and Reserve, New Mexico, on State Road 12. Cruzville’s map coordinates are: Lat: 33.80722, Long: -108.66472. While the facilities and the look and feel of this campground are just on the high end of ‘average’, the campground is nestled between the Apache-Sitgreaves NF and Gila NF which is some of the most beautiful country in America. This area merits the qualification of ‘destination’ and the Apache RV Park is the best-appointed facility in the region for exploring it. But its clean spacious bathroom and laundry facilities also make it a convenient overnight spot for any trip between this region of New Mexico and Arizona via NM, SR 12 or nearby US 180, both in the heart of Catron County, New Mexico. 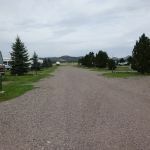 About 80% of the land in Catron County is in the public trust and, with about two square miles to every resident, it is a back country paradise. The base price of our full hookup site was $20. On top of that was a little less than $1 of taxes minus a $2 AARP discount. See the website for current qualifying discounts. Our spacious site had wild flowers in bloom along the perimeter and there were humming birds congregating around feeders before they headed south for the winter. I think I saw as many humming birds there in one day than I’ve seen in my entire life. The park roads and sites are paved with large chunk blue stone gravel. Access for big rigs is outstanding with all sites 60’ long and 40’ wide. Every site is wired for both 50 and 30 amp electrical service. Each site is wired for telephone but service is only available though a contract with the local telephone company. The current managers of this campground, ‘Bruce and Joanie’ are great people and I had a good time talking with them. They are knowledgeable about the area and a good starting point for finding adventure. But the high score the campground earns is not another case of a reviewer falling in love with the management. This is a rare full-hookup campground that happens to be a good value in a beautiful area so you can be sure that I will get back there as soon as I can. Save me a site! We camped at Apache RV Park in a Truck Camper. 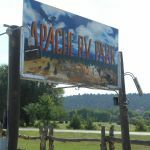 Are you affiliated with Apache RV Park ?